First and foremost in respect of this fantastic property is its location. Near to all major necessities for your holiday. 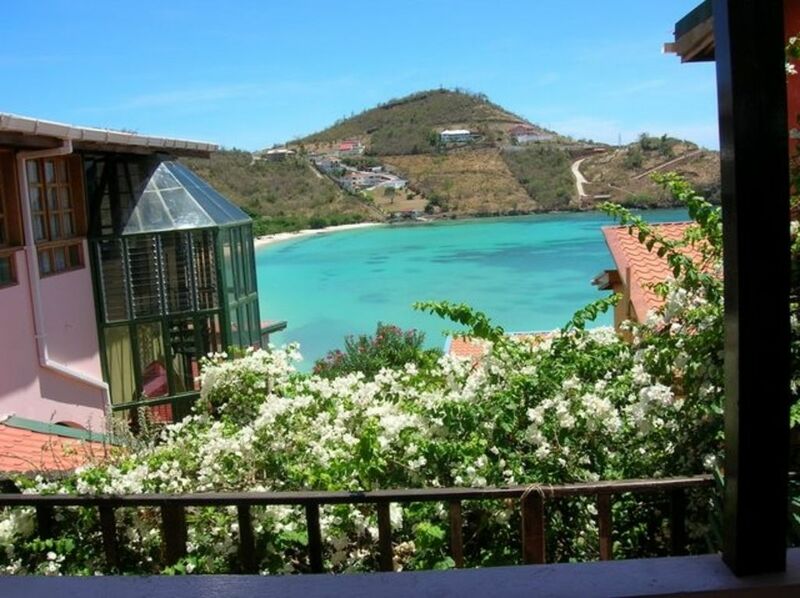 This unique two storey penthouse condo is situated at the top of Mahogany Run with spectacular views over the bay . On the first floor, 1 queen bedroom and 1 x 4 bedded with ensuite bathrooms, two lounges, dining area, and a vast balcony with spectacular views of the beach, bay headlands and sunsets. On the ground floor, twin bedroom with ensuite bathroom, utility room, large kitchen with breakfast bar and separate dining room, patio area with BBQ. This family home is totally geared up for fun in the sun. A welcome tray of a bottle of champagne, tea, milk, sugar, juice and biscuits are provided for arrival. Starter groceries can be purchased prior to your arrival, if requested. Housekeeper /cook service available up to six days a week to pamper and look after you to make this the self catering holiday without the chores! Books, DVDs abound all over the condo + Cable TVs in each bedroom and DVD/TV screen in lounge, together with WIFI, landline for local calls and 2 ipod players.There are many areas to relax so children and adults can find their own space; all this and only a couple of minutes down to the beautiful beach. Mahogany Run is a small complex of Italian designed condominiums with breathtaking views and beautiful gardens They are all privately owned for personal and rental use .There is a security guard at night although this is a safe and very quiet exclusive area .The gated steps down to the beach make this very safe for children and very quiet For those who want to totally chill out but be not that far from night life, restaurants, shops and activities, this is the perfect place for a holiday . Richard is a retired chartered accountant and Wanda is a retired Practice Manager. We live in the Midlands in the UK and enjoy playing golf and horseriding, eating great food, drinking good wines and exploring the many wonderful places in the world, one of which is Grenada. We fell in love with the island as soon as we stepped onshore from a cruise ship and the rest is history! We have three grown up children and two grandchildren. We have one of the best locations on the island to easily enjoy both the wonderful beaches and the delights of St George's with lots of restaurants and a large supermarket nearby, but quiet enough to savour the paradise that is Grenada. Other properties with pools are not conveniently situated to good beaches and we feel that to experience the beautiful calm sea in Morne Rouge Bay only a few steps away adds to a more enjoyable experience of the island and your holiday. We have spectacular views from our condo. Many lovely properties are situated in Westerhall and Fort Jeudy which are much further away from St Georges,the airport, restaurants, supermarkets, banks, etc. and the few small beaches do not have the same ambiance as BBC beach on Morne Rouge. There are hair-dryers and shaver sockets in all bathrooms . This is for the use of the housekeeper only. Beds are changed weekly and towels twice weekly. She will take care of all your personal laundry and ironing for an extra nominal fee payable to her. This is for the use of the housekeeper only. This home is huge with numerous sitting areas, a balcony that runs the length of the property and unique views over the beach, the bay and the far headlands from where you can sit with your cocktail and watch the spectacular sunsets .It is a family holiday home used frequently during the year by the owners' family and friends .The kitchen and dining area is large and very well equipped. There is also an upstairs dining area romantically overlooking the bay for candlelight meals when the children are in bed perhaps !! Smoking only allowed on balcony please. This is an older unit, but is spacious and clean. We are beach people so the easy access to BBC beach is perfect for us. This was our 2nd stay at this condo. We felt safe to walk into the Grande Anse area at night for dinner or a drink, and could walk to the grocery store as well. Great Location. Our favourite spot on site is our terrace overlooking the bay. We are there all morning with coffee, and again at cocktail hour. Thank you for your review. The fact that you returned for a second time says it all!! This is our secon year at Morne Maison. We’re planning to stay again next year. That should say it all! Thank you so much for taking the time to let us know that we are still doing things well and that you wish to visit a third time!! We love it when guests appreciate our corner of paradise as much as we do! We had a great time in Grenada and Morne Maison was a perfect house and perfect location for a family with two small boys (five and eight years old). It is an easy walk to two beaches that are drastically different but great in their own way (one serene and uncrowded and one pleasantly busy). The house is well kept and comfortable and checking in and out was very easy. The only thing keeping this review from being five stars is that there was very loud construction going on in the house next door during out stay. We spent most of the days out and about so it didn't bother us much though. We can only apologise for the disturbance of building work in the Mariposa residence next door, over which we unfortunately have no control. We understand that the major work has now been done and when completed will only serve to enhance the Mahogany Run condos. Thank you for stating that you would have awarded five stars as we strive to keep our very high standards. The condo is gorgeous, and situated to give the occupants views of the beach from each level. Everyone who is working with this property was extremely welcoming and gracious. We arrived late, but Elaine and Josh were there to greet us. We could not have asked for more, and would like to return. The property was great for our visit and accompanied 6 adults easily...awesome location! The location was within walking distance of popular BBC beach. It was great to have Diane around to cook some local dishes...delicious and inexpensive! Will definitely return! I recently stayed at Morne Maison with my wife, two daughters, my son, daughter-in-law, and grand daughter. The property is superbly situated above the most children friendly beach you will find on planet earth. Privacy guaranteed and the house offer every thing one can wish for on a family holiday. Thank you so much for taking the time to give your feedback. It is very much appreciated. We hope to welcome you back to Morne Maison some day. Nestled into the corner of Morne Rouge Bay, Morne Maison is situated in a discreet, quiet beach location The bay is wonderful and safe for swimming.Ten minutes walk however brings you to Grande Anse beach with first class hotels, a modern shopping mall ,scuba diving and sailing centres, banks, chemists and a varied selection of fantastic beach side restaurants. Travel further down the coast to visit St Georges, the hub of Grenada. Wander down the Carenage, arguably the most attractive port in the West Indies. Stop at one of the various bars for a carib beer, stroll through the spice market or shop at the cruise terminal mall for souvenirs. Hire a car to explore this wonderful island with its own rain forest and enjoy your own penthouse paradise for a cool rum and coke on the balcony watching the fabulous sunsets . Morne Maison gives you the best of both worlds; space to relax and unwind from life's hectic pace but near to turtle watching ,diving, sailing, hiking etc to give you an exciting fun filled holiday. Golf: There is a nine-hole golf course about 10 minutes drive away and the condo is equipped with 5 sets of ladies and gents clubs for your use. If you wish to play, you need to phone beforehand to book your start time and you may also wish to hire a Caddy (local lads who carry your clubs and are very helpful and friendly!) It is quite a challenging little course. Also see Overview of the property.